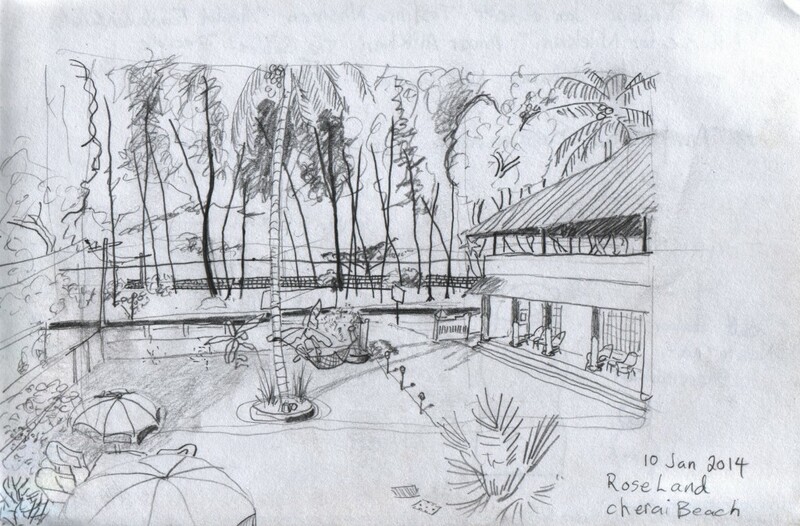 This resort on the outskirts of Cherai Beach was a haven away from the city. The placid ocean quietly lapped the beach with waves. I had the odd sensation that Cherai Beach was familiar, and my automatic direction finding sense kept telling me that I was in Tofino on Vancouver Island. This was my first overnight stop after I set out on my bicycle from Fort Cochin. The Malayalam name for Cherai Beach is ചെറായി ബീച്ച്. 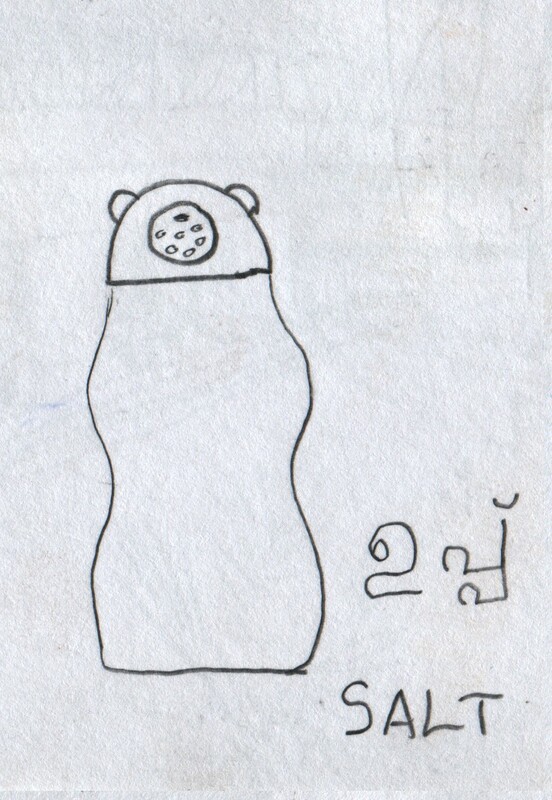 This classic flashlight is still in production in India. It has the thin, fluted, sheet brass body with bright plating and the slider switch. They updated it from incandescent to LED, a sensible improvement. Eveready makes it under the name, जीवन साथी (Jeevan Sathi), or “life partner”. 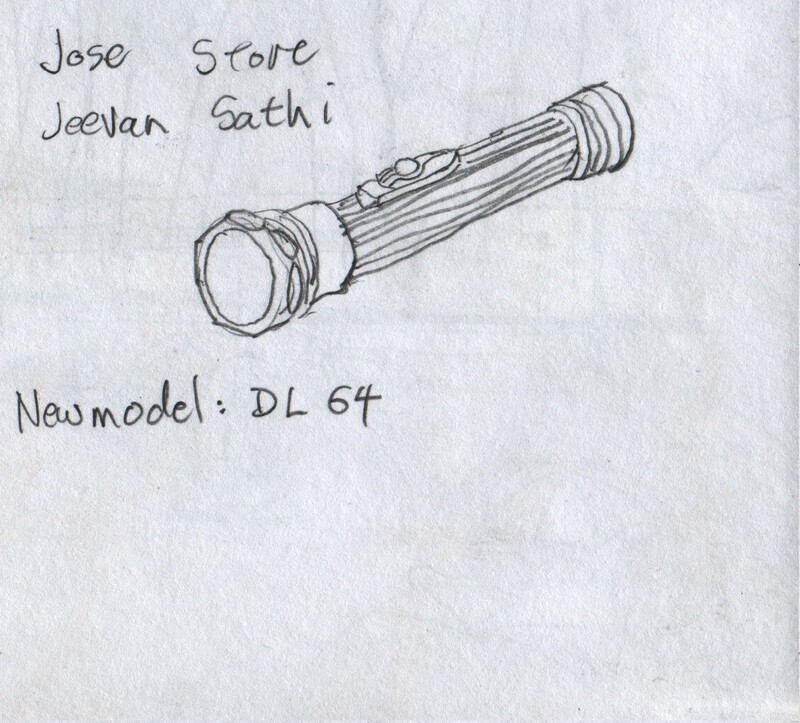 With the kind help of some local people in Mala, I was able to find such a flashlight to purchase as a souvenir. The Malayalam name for the town is മാള (Maala). I liked this plastic salt shaker that I saw at a restaurant. It reminded me of the bear-shaped honey dispensers that we have in Canada. The Malayalam word for salt is ഉപ്പ് (uppu). 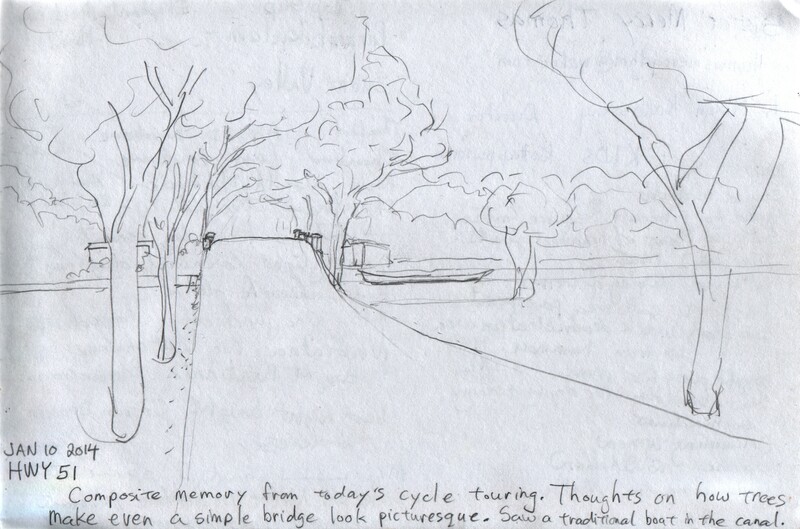 I drew this composite picture from memory, combining the impressions that I had from the day’s bicycle ride. Highway 51 was pleasant, mostly through countryside. Trees along the roadside help make even a simple bridge look picturesque. I saw a traditional boat moored in a canal. This highway flyover stands in Chalakudy. 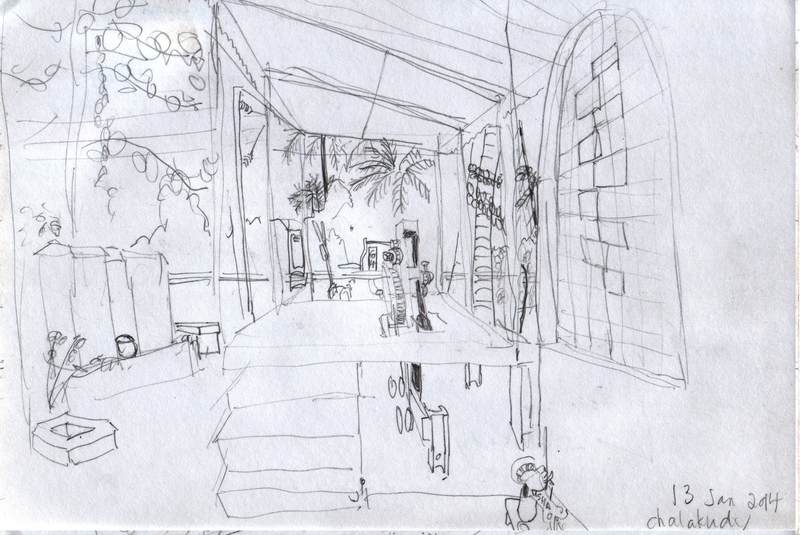 I tried to memorize what it looked like, and this is my sketch from memory. 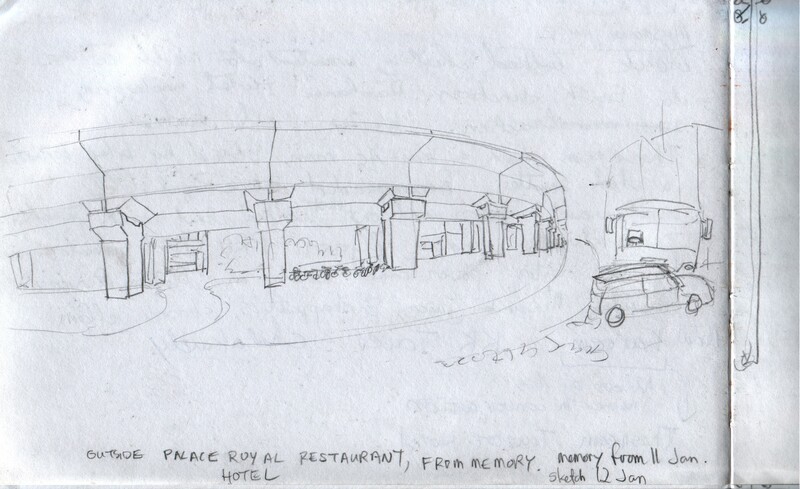 I walked under this flyover a couple of times when I went to eat at Hotel Palace Royal restaurant. This is a view of a level railway crossing near Chalakudy. There is a hand winch beneath a canopy, and the attendant manually lowers the barriers each time that he receives telephone notification that a train is on its way. The location seemed idyllic, in the countryside and right next to a river. I had a pleasant conversation with the attendant who operates the crossing arms. We discussed the pleasures of finding iron things and repairing them to bring them back into working condition. …but the salt shaker asked me to look again. and every time i look, i see something else. you have a remarkable collection here. Thank you for your kind comments! Thank you for taking the time to look through these drawings. I am glad that you also find something interesting in the things that caught my eye.